SAILING DANGEROUS WATERS (How and where to get it!) Click here to see video Teaser! 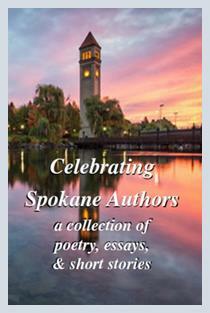 Look for my short story, The Unseen Visitors, in this collection of short works by members of Spokane Authors and Self-Publishers. It’s available on Amazon or locally at 2nd Look Books and Auntie’s Bookstore. Please contact me if you’d like me to speak to your group. Will speak to: Writing Groups, Book Clubs, Historical Associations, Naval History, Age of Sail Enthusiasts, and more. Notes: Does not claim to be an expert on any of the above, but over time has learned a lot and enjoys passing that along to others. For instilling a love of reading, which led to a desire to write: my late parents, William and Irene, and my recently departed sister, Leslie Ann. For unabashed enthusiasm for my work and showing me (and many others) the ins and outs of the publishing world: Anne. For chapter by chapter dissection of the first book: Carolyn, Nanette, Locke, Marilee, Michelle, Shanti, and Irene. For enthusiastically reading the first two books: Helen and Matt. For valuable advice on query letters, even as she sent me a rejection notice: Nadia. For overall support and encouragement: Eva, Jessica, Connie, fellow Spokane Club employees, fellow Inland Northwest Corvair Club members, members of Spokane Authors and Self-Publishers, and many others.